David Karp: "Tumblr Is Growing By A Quarter Billion Impressions Every Week"
Tumblr is growing like a weed, but “the last four or five months totally overshadow everything that came before it,” founder David Karp tells Chris Dixon in a taping today for TCTV (watch the video above). “We are growing by a quarter billion impressions every week,” he revealed. 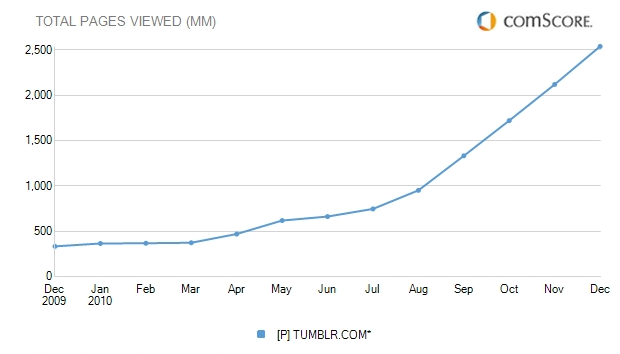 Last week Tumblr did 1.2 billion impressions, or pageviews, and it is adding 250 million every week. Just think about that for a second. Over the last 30 days, that came to 4.2 billion pageviews. If you are wondering why Tumblr’s been having so much downtime lately, just take a look at the comScore chart below, which shows its own estimate of 2.5 billion pageviews for the month of December, up from 335 million from the year before. All of that is coming from 19 million unique visitors per month globally, according to comScore. (Karp’s numbers are based on his own internal Google Analytics and they are for a slightly different time period, he also notes that Tumblr reports directly to Quantcast). Karp admits that the company was “unprepared” for that kind of hockey-stick hypergrowth, but with a new $30 million round in the bank, he says his team is working round the clock to keep scaling and catching up with all the sudden demand. Karp says the growth is coming in part from college students, who really took to the service only since September, 2009 or so and, more recently, international growth in Europe, Japan,and Brazil. He also tells me separately that 65 percent of those pageviews come from Tumblr users looking at their Dashboards (which shows the stream of posts from other people on Tumblr they follow). The video above is an excerpt from a longer conversation with Chris Dixon for his TCTV show Founder Stories (formerly Startup Sherpa). We will put up more excerpts and the full interview next week, in which Karp explains why the two people he looks up to the most are Steve Jobs and Willy Wonka. Update: Watch Part I, II, and IV of this interview.